Find the best Thirsty Swagman trips. 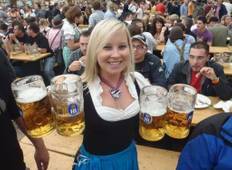 From Germany to Czech Republic, TourRadar offers 6 tours through 4 countries from Thirsty Swagman. The tours span across 4 day to 11 day itinerary with prices ranging between $142 to $361 per day. "I absolutely loved Thirsty Swagman tours! 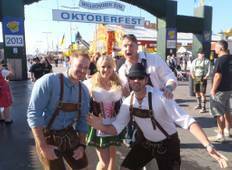 I’ve done Oktoberfest twice, and the..."
"It was my first time to experience the Octoberfest and it was one of my best moments..."
"We couldn't have been happier with our Oktoberfest experience. Thirsty Swagman really..."
"This was a wonderful tour and they made sure we had a wonderful time! Loved all the..."
"good location great hotel nice group and guide wonderful moment"
"I've done a few tours with Thirstyswagman before but this was definitely one of my..."
"Best accom location you could hope for, seriously! Fantastic tour guides that just..."
"Serena and Max were such amazing guides. They made sure we were all safe and cared..."
"You cannot go wrong booking any tour with Thirsty Swagman, but if you have to choose,..."
"From the Party Beaches of Santosa Island, to the entertaining and limitless adventures..."